OK, it was just 3.1 miles, but my plan was to go out and attempt to do my best with 2ish and be happy. My legs felt so good at the point where I would have turned home to run 2, so I kept going. Free from my fiberglass shackle! This was yesterday and my first run--first workout of any kind--since I busted my wrist in 2 places 5.5 weeks ago. The day before yesterday I had my long arm cast removed and replaced with a removable splint. I wear the splint for 10 days, aside from showering and range-of-motion and stretching exercises. The run felt really good. Not fast, but I also took it VERY easy. My arm felt a little tender with the movement of running and actually hurts a good deal more with the cast off than it did with the cast still on. My orthopod. warned me of this and instructed me to take the prescribed narcotic pain med in half-to-whole doses. There have been moments where my wrist hurt as much or more than it did when the injury was fresh. This is in large part due to severely atrophied muscles and tendons and ligaments that are essentially sprained (wrist fractures with bone displacement rarely don't have significant soft-tissue damage). 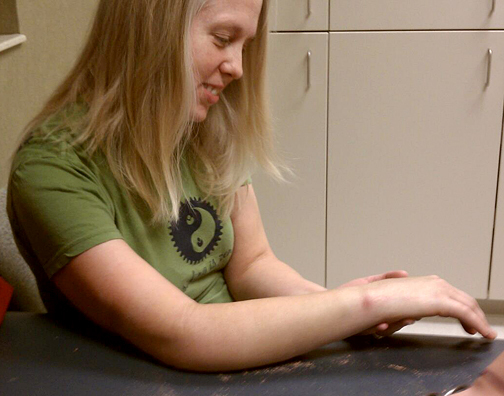 I also still have a good deal of swelling in the wrist joint and hand that prevent flexibility. Today I had some relatively mild delayed onset muscle soreness (hammies, quads, abs), but I was expecting that. 5+ weeks of 0 activity do not come without a price. I'm just so thankful that I felt so strong and comfortable actually running. The only obvious effect was, perhaps, a decrease in aerobic performance. But as an asthmatic that's the sort of thing I deal with randomly even under the best of training circumstances. And I am already finding that my wrist range of movement is better today than it was yesterday--I'm 2-handed typing, again!! !--so I expect that my recovery will go well. I have a follow-up appt. with the doc in just under 3 weeks. I'm guessing that by that point I will have minimal pain and some functional use of my hand and wrist. Perhaps I'll be able to manage some "nowhere bike" rides in the coming week or so. Well...I don't think I should attempt that until the splint is off, so not for another week+. For now I am focusing on easing back into running. Given how well my 5k run went yesterday, I think I'll do another 3 tomorrow and continue with 3-4 milers on alternating days for the next couple of weeks. I have 2 weeks to carefully rebuild some fitness before I start training for my early April half-marathon(s). I'm planning to more-or-less follow Hal Higdon's Novice 2 training plan, which starts with a week of 3 3-milers and a 4 miler. To celebrate I ordered a new pair of running shoes (and also because I am due to add a new pair into rotation)! I ordered the sort of "weatherized" version of my favorite shoe. Seems fitting as we are in the middle of Winter...or "Winter." I'm not minding that we've had little snow. I'd not be venturing out for runs with this wrist business were there measurable snow on the roads. Our roads are essentially bone-dry--phew! 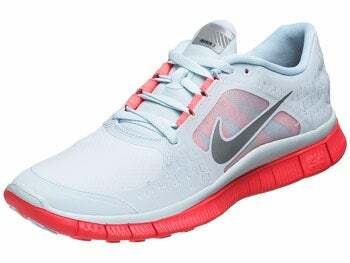 The Nike Free Run+ 3 Shields should be nice once we get into Spring sloppies, too. I also purchased another necessary evil: wrist guards for both arms. It's quite clear that I should be encased in Nerf™ or bubble wrap for off-road riding astride 2 wheels, but since that would be rather uncomfortable and not particularly sweat-wicking, wrist protection of the sort that downhill mountain bikers wear is the next best solution. I wear a helmet to protect my fragile head, so it only seems wise to protect wrists, given how common wrist injuries are in the mtb community. Troy Lee Designs 5205 - they even match my mtn bike! I did a little research and found that other mountain bikers who have suffered similar injuries have found the Troy Lee Designs 5205 wrist supports work well as a means to prevent wrists from mangling (or at least lessen the degree of damage) during mtb falls. I purchased one for each wrist. At $35/each they seemed like a small price to pay for a bit of insurance against ever being handicapped like this in the future. AND ever having to take such an extended break from activities I love. I'm guessing it may be another 2 months before I'm able to ride any bike outdoors. I would likely wear these on the road bike for a while, too--until I have full strength to support my upper body well. The more I baby myself now and don't overdo things, the faster I'm likely to be able to get back to riding and running strong. Better to be a bit conservative and have a down year now than to go out too aggressively and risk never again having a strong one. Managing injury recovery well is in really just as important as training well when not broken. Though I will say that I'll be bummed if I don't get a chance to ride my new fat bike in the snow this season. Slightly changing my focus/goals for the year may be necessary, too. I wanted to really tackle some mountain bike races closer to Fall. That may end up being an unwise plan, so my alternate plan would be to concentrate on duathlons, again. This would be far from the end of the world. I did several dus 2 years ago and really love that event. I love that it makes equal use of both of my sports and the strategy involved...and leap-frogging other racers in each leg, depending upon our individual strengths. I wouldn't mind doing that again this year, if need be. I don't think I was ever as fit as I was when I was training hard for those events. It would be interesting to see how much stronger/faster I could be with continued weight loss, too. This broken bones cloud could certainly have a silver lining. And my mountain bike will still be there for racing in 2014 if I have to wait until then to do more than casual rides. Yay for running ! And I hope your wrist heals quickly ! Thanks...I just got back from my 2nd post-injury run and it was good. Phew, I think the worst is behind me, for sure.